Local Meetings, Discussions, Demos and Successes! For those of you who may have missed this past meeting or want a recap on it, we have some exciting news: Theresa captured it all on video, which will also be made available online! We’ll make an announcement once it’s up. For now though, we have her Powerpoint slides AND a bibliography of all the source material (not shown during the talk). She’s also chosen to make her contact info available for anyone with questions or comments about the subject! You can find her at theresadevine at gmail dot com or tcdevine at asu dot edu. We have another great announcement! 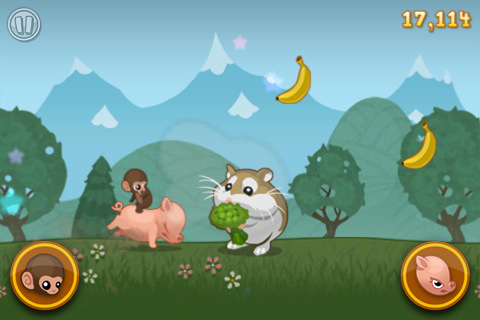 Kihon Games, our nearly-local friends out in Tucson, have released their game for iPhone/iPad, Baby Monkey (Going Backwards on a Pig)! It’s an addictive little game that pretty much speaks for itself. Based on the popular youtube video of the same name, it even features the original song by Parry Grip! Here’s a link to their game in the app store (only 99 cents!). Congrats to Kihon! Can’t wait to see what you guys are up to next! 7 PM at Claim Jumper Restaurant in Tempe! September’s meeting is GAME DEMO Night! The format will be a little bit different from the usual, so let me explain: First of all, anyone with a game demo in ANY stage of its development is free to bring it in for people to playtest and watch it during “mingling time”! And in fact, the main presentation will be pretty short so everyone has plenty of time to do just that. However, just after the announcements at 7, we’ll be showing a total of 6 actual demo presentations, each 5 minutes long. These demos can be anything you want: showing docs and screenshots, a brief powerpoint presentation, or even playing your game on the big screen! Each of these presentations is an open slot, which can be reserved by e-mailing me! (corey@igdaphx.org) Presentation slots will be assigned on a first come, first serve basis. So if you have a game you’d like to present, let me know SOON! In the October meeting, we’ll be returning to our usual speaker/presentation format, as we welcome BACK to the IGDA Phoenix stage our very own Ara Shirinian! Those of you who are longtime IGDA Phoenix attendees may have remembered his speech last year. As a matter of fact, Ara’s our very first IGDA speaker to make an encore appearance! He’s a fantastic designer and writer with a wealth of knowledge and experience. If his extensive list of released games and publications doesn’t convince you of that, just check out this awesome Gamasutra article and postmortem, published just last month! We’ll have more to announce here as we get closer to October. Look forward to this one for sure! Finally, I just want to remind you guys that we’re still on the lookout for ideal meeting locations! We like places that are big, accessible, quiet, and preferably have some good stuff on the menu ;D If you think you know of a good place to check out, please let Kyle or I know! (kyle@igdaphx.org) (corey@igdaphx.org). That’s it for now, see you all in September! Game demo-ers, don’t forget to email me, and as always check us out on Facebook and Twitter! This is the same place as we held our July meeting, and it’s located right next to AZ Mills Mall on East Baseline Road. We’ll be starting promptly at 7, so be sure to get there and grab your seat! We’ll be presenting our announcements and games in progress before the start of the talk, so if you have anything you’d like us to announce OR a screenshot of a game you’re working on, please send it in to me (corey@igdaphx.org)! Theresa Devine is the Chief Executive Artist of Zamtox, LLC. Zamtox is a game company with the vision to initiate a new dawn of creative, critical thinking for the enrichment of all lives through mainstreaming art. The company focuses on developing analog and digital games which combine entertainment and conceptual depth. Theresa received her MFA in Painting at University of Houston in 1994 and her BFA in Painting and Printmaking with honors at Texas A & M University at Corpus Christi in 1991. In addition to running her game company, Theresa is currently faculty member at Arizona State University where she teaches Computer Science and Interdisciplinary Art in the Mathematical and Natural Science and Humanities, Art and Cultural Sciences Divisions. Previously she was a resident artist at the Chicago Printmakers Collaborative and a faculty member at Columbia College Chicago where she taught Programming and Game Design. Over the past 12 years, Theresa honed her technical skills within the technology departments of small startup and large corporate companies. She has fulfilled the roles of programmer, technical lead, analyst, designer and architect. Prior to working in technology Theresa taught art in the Diocese of Galveston-Houston and Cypress Fairbanks Independent School System. She served on the Cypress-Fairbanks curriculum committee and was a major contributor to re-write the Junior High Art Curriculum. Theresa was born in Stevenspoint, Wisconsin and spent most of her childhood in Dixon, Illinois. During her high school years, her family relocated to Houston, Texas. For the next 23 years she lived in a variety of cities in Texas before to returning to the Midwest. She currently lives and works in Phoenix, where she enjoys the sun, amazing coffee and the optimism of the game community. As you can see, she’s all kinds of qualified to give an awesome talk on a subject she is VERY passionate about 🙂 don’t miss out! Matthew Wegner of Flashbang Studios will also be there, selling some awesome books on a wide variety of subjects- game development, project management, programming, and more- for $5-10 a piece. There are a lot of good reads, so if you’re interested, be sure to bring a little extra money with you!